After 3 months of work, it was time to get back to cruising so we started with a warm-up of 1 month of “land-cruising” before we returned to the boat. The first order of business was checking in with Betsy’s family so we flew to Cleveland to visit her parents and were gratified to see her dad recovered from his medical disaster of last year. We drove together up to Rochester, NY and had a great visit with her brother and his family, then flew back to Seattle. Next we traveled to visit our Canadian cruising friends with whom we had gone to Copper Canyon. They conveniently still live on their boat in Brentwood Bay near Victoria so we got to stay on a boat again and visit Victoria, one of our favorite places, while reminiscing and laughing a lot about our year of cruising. We returned to Seattle and, after the spending frenzy that our other cruiser friends tell us is de rigeur, we packed up the van and left town. We have too much stuff again, but, that is nothing new for us. We headed to Denver, somewhat off the beaten track of a straight course to Mexico, but we wanted to visit the last of Betsy’s family, her older brother in Denver. 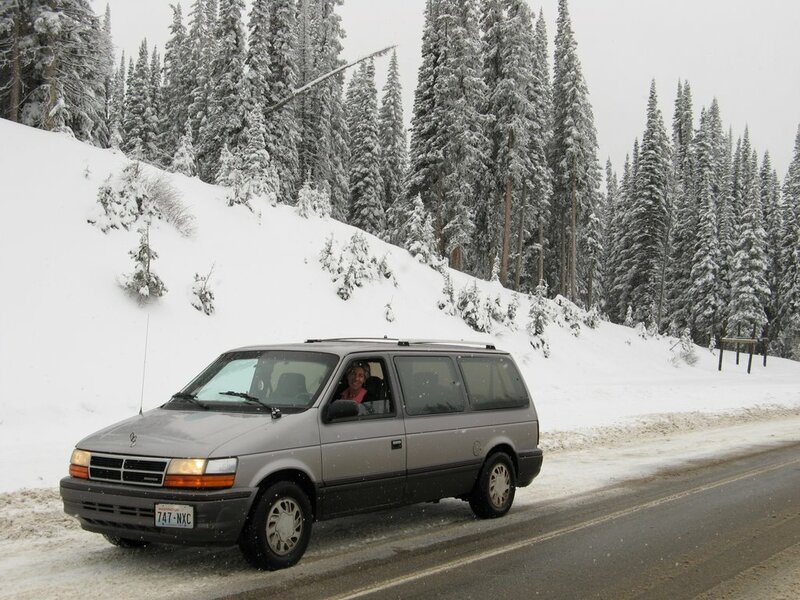 We had concerns about our old van in the mountains, but, we didn’t truly expect snow to contend with. Nevertheless, it’s been an early snow year in Colorado and, as we crossed the border from Utah on our third day of travel, it was a cold day and had snowed the night before in the mountains. We drove through Steamboat Springs where there was snow and had a hairy drive over Rabbit Ears pass with snow and ice on the road. We snickered nervously at the sign that said chains or traction tires required thinking, “We suppose bald rear tires don’t really qualify.” Well, all was well that ended well and we arrived in Denver without incident with snow on the ground for the next couple days. Brrrrr. We had a good time catching up with Betsy’s other brother and his family. After our Denver visit we headed over 5 mountain passes to Durango, Colorado in the Southwest part of the state. As we headed south, the roads remained clear with snow visible only on the highest peaks so the driving was easier. On the other hand, on the last and steepest pass, Wolf Creek, with a 7% grade on the downhill side, our brakes suddenly started smoking about halfway down. Betsy was driving and must have been sitting on the brakes rather than pumping them. As we pulled into the scenic turnout, the brakes were smoking in earnest with a not so delicious burning rubber smell. Naturally all men in the area gathered around, drawn, as always, to any sign of car trouble and very kindly lent their two cents worth to the issue. 4 guys in hunter garb (it was deer and elk hunting season and most of the cars/pickups we passed were full of guys in bright orange vests and hats) gathered around and told us, “you gotta pump the brakes, don’t sit on ‘em”. Betsy said something about stepping back before the whole car blows up and one of them said, “Aw, let ‘em cool off and stay in low gear on the way down. You be awraht.” Well that’s become our mantra for the trip: you be awraht. We arrived at Barb and Lyle’s brand new house in Durango a day before they arrived home. We were welcomed by their 20 yr old son and enjoyed the lovely home and cooked him dinner. They arrived home the next day and we had a terrific visit for a couple days while we hatched our next travel plan. Durango is a darling town with a combination of modern conveniences and old west flavor. We enjoyed an unusual day of pouring rain and walked from one end of town to the other in it (hey, we’re all former Seattlites, what’s a little rain?) Then we unloaded our computers and SSB radio and scuba gear and other miscellaneous expensive items in their 1100 sq ft garage (are you sure our stuff won’t be in your way Barb and Lyle? ), loaded up their extra warm down sleeping bag and thermarest pads to add to our cheap tent and sleeping bags and took off for a Southwest National Parks tour. This area of the country is unbelievably beautiful. We had never been to Zion and Bryce National Parks in Utah before so we headed west. The drive took us through beautiful territory, stark with gorgeous red rock formations. 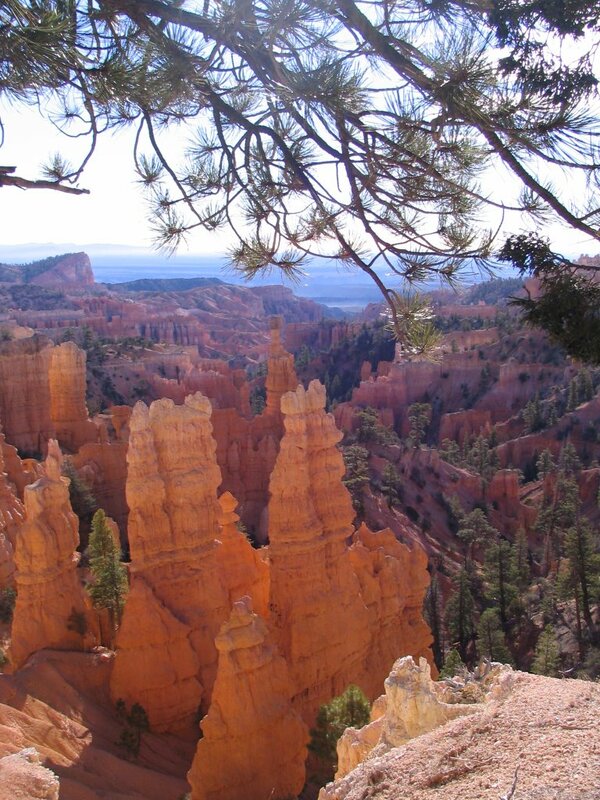 As we headed into the canyons of Utah, the terrain became even more contorted and beautiful. We stayed a night at the Bob Bon Hotel in “Little Hollywood”, Kenab, Utah. The area was the sight of much of the filming of many historic western films and the hotel office had signed pictures from many of the big stars. The hotel itself was on the “quaint” side and our room was not a lot bigger than the salon of our sailboat, but, it was a place to sleep that night when it was 32 degrees outside. In Zion we hiked the Hidden Canyon trail, climbing to 1000-2000 ft above the floor of the park, we clung to a rock face with the help of the installed metal chain handrail as we circled a rock face on a ledge with the drop-off just beside us. Later Lyle cheerfully told us that they lose a couple people over the edge on those trails each year. It was beautiful, but not for the acrophobic. 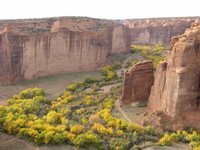 The trees were changing colors and as the sun shone through the yellow or red leaves, the whole canyonside was lit up with the color. It was stunning. Even better, there were few crowds due to the late season. Bryce was a fantasyland of multi-colored rock sculptures. We walked the Fairyland trail, aptly named for the scenery indeed seemed fantasy-like. We met a couple who were taking a break from their bicycle adventure, having already cycled 4600 miles from the Arctic to LA and planning to head to South America after this break and they were traveling with their new Kiwi friend who was cycling alone on his sabbatical from high school teaching in New Zealand. We became fast friends from our shared experience of taking the alternative path in life—leaving the straight and narrow to embrace travel. 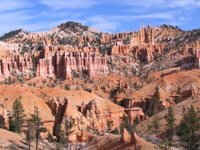 From Bryce, we headed to Arches National Park where we saw another of the myriad manifestations of this sandstone/erosion land. The park is very accessible by car though we did some hiking there too; the red sandstone arches and stone formations take almost animal like forms. We camped there, awakening to the early light on the rocks and the bunnies risking some early morning foraging. While driving one day we watched a hawk right by the side of the road circle and then suddenly dive to catch a bunny. Life is grim in this land. Canyonlands was next, with yet more variety on the rock formations in the area. There we again camped in freezing temperatures and slept to the lullaby of the loud snorer in the campsight next to ours. We thought about referring him to my brother, the sleep specialist, but figured his wife was going to have to be the one to put her foot down, it wasn’t our business. 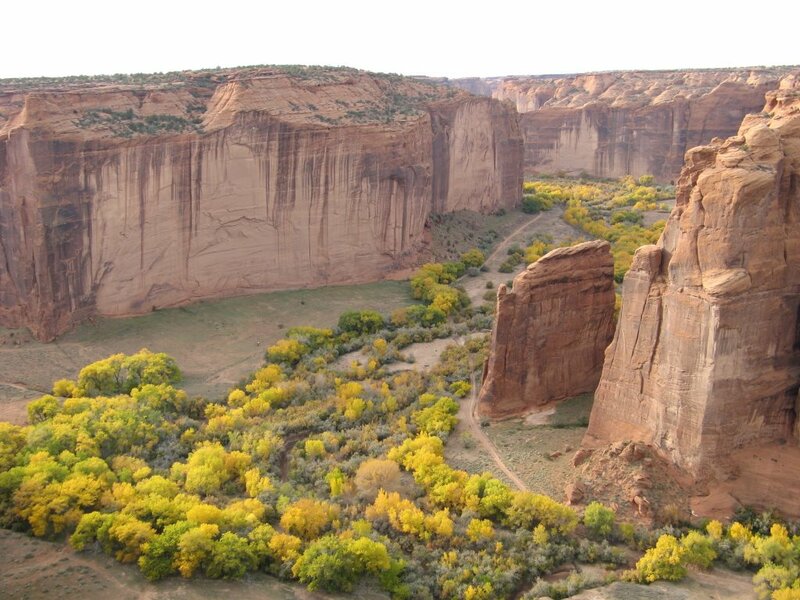 Not ready to head back to our “stuff” in Durango, we made a last dash to Canyon de Chelly, a stunning place in Arizona where Betsy had been 21 years ago. 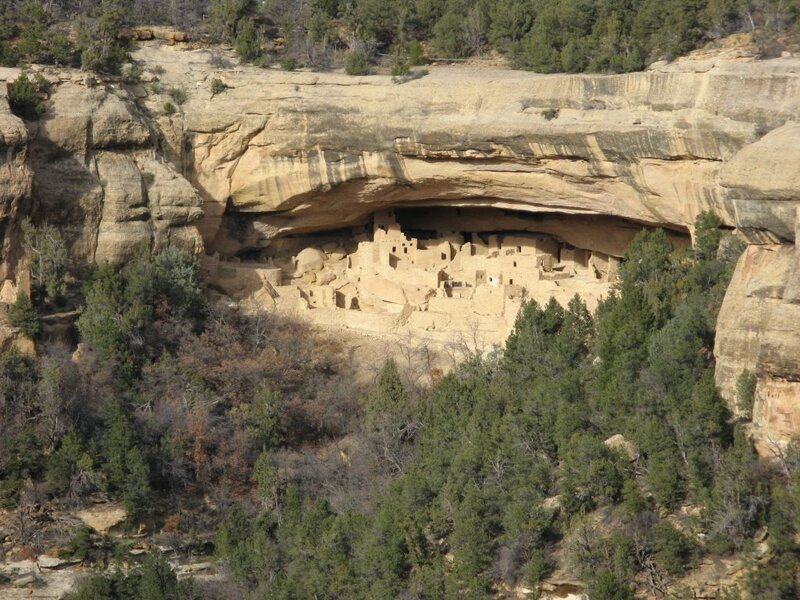 This Canyon has been lived in by Native peoples since early AD and the Pueblo or Anasazi people (ancestors of the modern Hopi) built cliff dwellings there around 1200-1300 AD. 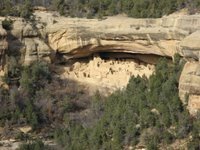 The Navajo currently live in the canyon and, other than one trail to a cliff dwelling, the canyon is off limits without a Navajo guide. 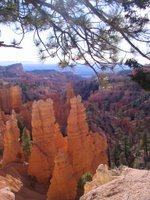 It is still an awesome, gorgeous place both from the rim and from the one hike down and we were both moved by the scenery. Betsy was struck by the newly garrulous Navajo we met selling their wares. When she lived in Gallup on a med school rotation 21 years ago, the Navajo were striking for their silence and stoicism. Now, every stop we made where they were selling their wares, they spontaneously began telling us about the merchandise, how it was made, the prices, etc. It was such a repeated experience that we began to suspect that a marketing training program had occurred among the Navajo in the last 20 years. Our friends Barb and Lyle confirmed that they too had noticed the change and said they’d see if they could find out more about it. The crafts were beautiful but we mostly resisted the urge to purchase more stuff. Now we’re “home” in Durango tying up the last loose ends, having let the last (we hope) tropical storm of the season blow through Mazatlan in the last week of October and preparing to head to Mexico in a couple days drive. The van has remained functional and has been a great travel vehicle for us. We’ve nicknamed it “Ducky” for the devil duck in pirate garb that was a going away present from our friends Joan and Will in Seattle. Ducky rides on the dashboard next to the Virgin of Guadalupe, our travel guardian. You can never have too many guardian saints we figure. We’ve become attached to Ducky and hope we can find a good home for it when the time comes. So onward to Mexico, Qayaq and the next chapters. Land cruising has been wonderful and, though we’re financially poorer, we are surely psychically richer for the experience.